“After Work Cocktails”: A pencil drawing I did sometime in 1962-64, while I was majoring in art at Southern Methodist University. It is copied from a liquor advertisement in some magazine and is one of the best pieces I ever did. The ad drew me to it by its interesting balance of light and dark areas, the way forms were created by shadowing. That was what I emphasized. Framed, the drawing now hangs on a wall in my small study, constantly reminding me of the talent I hid under a bushel. When they design the urn for my ashes, the potter should paint upon it the following title: “Bob ‘The Trier’ Litton” just to record the persistence with which I have tried to drop this blog. I grow weary and self-critical when I constantly check out my stats page; it’s a downright juvenile habit. I tried to discontinue “The Vanity Mirror” again just recently: You might have noticed the big “Goodbye” at the end of my last post. As was the case in some of my prior efforts, the aim was to withdraw from my computer and take up pencil and pad to resuscitate, if possible, my sketching talent. I was not very hopeful, for I have allowed that talent to lie unused for so long that it has nearly atrophied. I have a small sketchbook in which are page after page of the same composition: a frontal view of three men on horseback with polo sticks in their hands; they are so close together that the viewer is bound to assume they are about to have a collision in the next pounding of a hoof. My “model” source is a now yellowing photo that I cut out of a newspaper years ago. Previous attempts at copying the image were so disappointing that I set my pad aside and returned to other occupations, including this blog. These recent drawing efforts, however, have shown some improvement — enough to be encouraging. But another, rather odd, factor has entered to help me stay on track: the fun of analysis. I have read too many Sherlock Holmes stories and seen too many SH movies for there not to have been a residual effect. And, like Dr. House, I analyze virtually everything, often when I shouldn’t, according to one of my brothers. However, in the present case, that habit has worked toward my benefit: It has given me a way of enjoying pencil-pushing apart from any aesthetic pleasure I might derive from the products themselves. I will try to explain. Firstly, I noticed years ago when an artist friend sketched the same picture I am working on how his eyes switched back and forth, frequently, from the photo to his own drawing, and how he never seemed to draw a line longer than what he had viewed. I admired his ability to do that and doubted my own ability to emulate him, for my tendency is to glance at the subject, depict some of what I had seen and then ad-lib into a longer line, maybe even more lines, relying upon memory or what I reasoned should occupy that extra space. I believe that now I have conquered that ability at least slightly; and — who knows? — it might be a skill that can be developed further, like a bicep. Proportionality is another element that now fascinates me — the struggle to realize that I am trying to reduce a 7×10-inch image to one of 5×7. I developed a proportioned grid, but it did not help because of the small dimensions I was working with, so I returned to free-hand drawing. It is quite difficult to maintain a consciousness that the line I am now drawing on this page is not to be the same length as that rider’s shoulder; it needs to bend sooner. And those horses — all three being reined toward a left turn — are leaning somewhat; their shoulders, withers and heads should indicate that. Speaking of heads: I noted the varying degrees of fore-shortening among the mounts’ heads. Although hard to achieve, the challenges of such effects are fascinating to puzzle over and then pull off. The faces of the riders are just as difficult to render, especially the one in the middle because he is grimacing as though he were grinding his teeth. The sketchy result too often makes his face look like the grill of a 1940-era Ford. I’ll save that one for my final stage of deliberation and action. Have you grabbed my point yet? The intoxication of determining my areas of weakness — my flaws — and problem-solving have surpassed any aesthetic goal I have. Those impulses are helping me finish something (I hope) that I might not have otherwise. Subject matter is a problem for me, too. As a child I loved horses and wanted one very much; but I was a poor city boy, and having a horse was an impossible dream. Now I am next to indifferent toward horses, yet I must concede that there is something attractive about them as art subjects: I wish there wasn’t. I feel we artists have concentrated on horses too much and over-long. The same is true of the human figure. What is there about the bodies of humans and horses that causes them to dominate our art? I suppose it is because, for one thing, we are intimately connected with them; and, for another, their musculature is often prominently displayed. Perhaps I should add that humans and, to a lesser extent, horses can do things other creatures cannot. However, the various apes and monkeys are quite capable of various activities, too, but we don’t draw them very much. Strange! Perhaps I am committing an etiquette gaffe in publishing this blog before finishing the polo drawing, but I just wanted let you know I am still alive, sitting on the fence of abandoning my blog or slogging onward. If I ever finish the drawing I’ll publish it. SPECIAL GIFT — Howard Collier, a Reeves/Culberson Counties Rancher, demonstrated dousing or “water-witching”, as it is often called, in 1986. Collier accepted the ability to find water with a douse as a gift. © 2011 Story and Photo By Bob Litton. All Rights Reserved. NOTE TO READERS: This feature article first appeared in the Pecos Enterprise in 1986. Shortly thereafter, it was distributed on the Associated Press wire and was published in various newspapers throughout Texas (and I do not know how much further afield). Howard Collier was 66 years old when this article and photo were published. The story he related to me below simply flowed from his lips and thus rendered it probably the easiest writing I have ever done, and the most fun. He was quite a genial man; and I treasure the brief acquaintance we shared. Some of you might wonder why the paragraphs are as brief as they are. Well, that is newspaper style: it is a technique for augmenting readability. And, while it is true that I have condensed previous posts, retrieved from my stash of old newspaper articles, by combining paragraphs into “literary style”, in this instance I have retained newspaper style because so much of it involves quotations. Also, I believe that here at least the old journalistic dictum “white space is good” does speed up compre-hension. 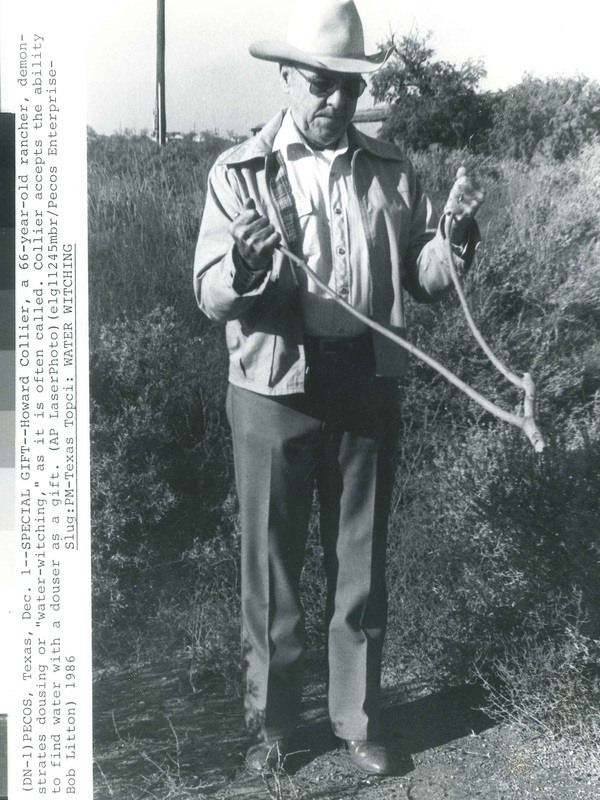 PECOS, Texas — Some people search for a scientific basis for dowsing — or “water witching”, as it is often called. Still, he is aware of the explanations others have come up with for people who profess to have the power to find underground water with a divining rod. “It has something to do with the magnetism in that stick and in your body and in that water vein down there that causes the stick to come down,” he said. The 66-year-old rancher said that he learned about water-witching and that he had the gift when he was 20. Collier was working that summer on his father’s Screwbean Ranch in northeast Culberson county. Early one fall day, he and the foreman rode horseback to a site on the ranch where his father had built a dirt tank. “It was the tail end of a terrible drought,” he recalled. “The soil scientists had concluded we needed to conserve soil moisture better than we had. “So the government had come in with the Triple-A program — what’s now called the ASCS (Agricultural Stabilization and Conservation Service) — and part of that program was the ‘dirt works’ program. There were thousands of miles of terraces in West Texas. And they built spreader dams and dirt tanks. “Just two weeks before, my father and I had ridden out to see it. The thing was about two hundred feet square and about ten feet deep with sloping sides. There had been some good rains and it was full. The water had backed up about a quarter mile past this dirt dam. “What do you mean?” said Collier, who had never heard the phrase before. “Well, get down off your horse and let’s find us a greasewood forked limb,” Greer replied. After cutting two forked limbs, Greer showed the young man how to hold the witching stick. Together they walked over a part of the ranch where the terrain showed promise of good water. Suddenly Collier’s stick started pulling down toward the ground, so much that he had to use force to hold it straight in front of him. The experience frightened him, he said. In the 1960s, Collier decided he wanted to locate windmills on his home ranch in Reeves County and irrigation wells at the ranch headquarters on Toyah Creek. A brother-in-law, Fred Armstrong, did the engineering work, and Collier did the water-witching. Every water witch prefers a certain type of wood for the forked stick. Hackberry is a common source, Collier said, as is the peach tree. “I like greasewood,” he said. Others forgo wood altogether, preferring metal rods. “Some people swear by brass welding rods,” Collier said. Although most scientists dismiss any physical reality in dowsing, a few do not discount it so readily. Zaboj V. Harvalik, a retired University of Missouri physicist, thinks it is real. Harvalik’s experiments have indicated that a person holding a dowsing stick can detect buried electric wires, apparently because the human body is sensitive to small changes in the Earth’s magnetic field caused by the currents flowing through wires. Since water, ores and other buried substances also affect the magnetic field, Harvalik suggests, dowsing has a physical explanation.